The nationalist residents of the Short Strand endured five nights of loyalist violence this week in east Belfast as loyalist mobs attacked with petrol bombs, fireworks and other missiles. The trouble began on Sunday when loyalists clashed with nationalist youths before throwing bricks, bottles and pieces of masonry from the Castlereagh Street side of the interface. By Monday, the trouble had extended to the Woodstock Link, Albertbridge Road and Templemore Road areas. Several petrol bombs, paint bombs and very powerful fireworks were thrown, as well as the usual range of rocks, masonry and other missiles. In Bryson Street, the attacks lasted nightly until 3.30am in the morning. By Wednesday, residents were trapped in their homes and fearing for their lives. The fireworks were described as sounding “like bombs”. Windows were smashed and roofs damaged by debris causing hundreds of pounds worth of damage. 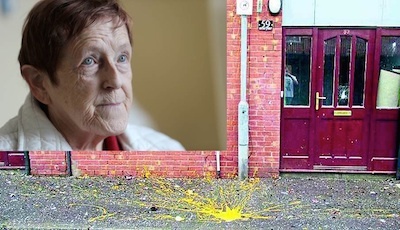 One pensioner, 75-year-old Mary Morgan, was treated for shock after her house was attacked. She was also treated for cuts to her head and feet after glass fell on her. Ms Morgan, who lives alone, said she thought a bomb had exploded when her house was attacked shortly after 6pm on Wednesday. The 75-year-old, who suffers from a heart complaint, was showered with glass and forced to stay with relatives overnight. “I’ve lived here all my life. I’ve been in this house since it was built about 30 years ago,” she said. “I’d been to the heart clinic earlier in the day and was tired so I put my head down on the sofa. I must of just dozed off when I heard this almighty bang. I really thought a bomb had exploded. “There was glass everywhere, all over me, and when I tried to stand up all over the carpet. The place was a mess. I was terrified.” She said one of her neighbours came running straight away to see if she was okay. Sinn Fein Councillor Niall O Donnghaile said he believes the violence was deliberately orchestrated. The Republican Network for Unity said its activists had been “on the ground” at Short Strand to assist residents who were again “under a siege from loyalist gangs”. They blamed the attacks in Bryson Street on UVF paramilitary outfit gang operating in Thistle Court. No PSNI were present on the loyalist side of the interface, they said, but there had been four on the nationalist side. They also said that CCTV cameras appeared to point exclusively towards the nationalist side. They accused the PSNI of being “in cahoots” with the UVF, and linked the violence to unionist attempts to negotiate further gains and concessions in talks. “The continuing loyalist sectarian attacks on the people of the Short Strand illustrates the unchanging reality of life for large sections of the nationalist community in Belfast and throughout the North of Ireland. Meanwhile, a group calling itself the ‘Real’ LVF was said to have issued threats against prominent republicans. Martin Og Meehan of the RNU said he and colleague Sammy Cusick had been told their lives were under threat. “Once again reactionary Loyalism has raised its ugly head in order to issue a death threat to myself and my friend Sammy,” he said.